Today's post is just a quick one to show you all my latest work. Emma booked in for nails to be done. She showed me a photo of the shape she wanted and the style. Unfortunately Emma has ripped half of her nail away on the ring finger of her left hand so I used a custom blend powder to cover the nail beds to mask this. The tips are actually sparkly white although the photo doesn't really show this. These are the first time Emma has had extensions that haven't been square so it's a nice change for her. 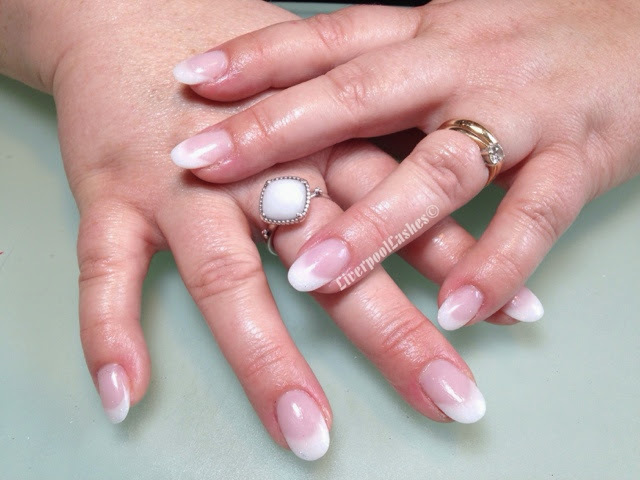 I actually really enjoy oval nails, I think they're very flattering, what do you think? These are gorgeous!! I love them!